Thank you. Two words that let your employees, associates and clients know that you are appreciative of what they have done and what they mean to you and your business. 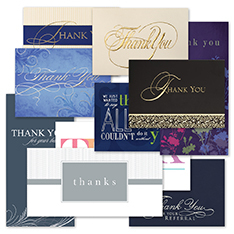 Whether its thank you for a job well done, thanks for a business referral or for an opportunity to serve, thank you card assortments from Brookhollow provide you with the right sentiment.